Chris Evans, our protagonist, leads the rebellion against these oppressive leaders and the film shows him fighting his way through a series of train cars, each one more diverse than the last, until an inevitable showdown at the front of the train. Overall I thought this movie was great — I had pretty high expectations going into it simply because I trust Chris Evans’ ability as an actor. Plus, the last movie I had seen of Bong’s was Gwoemul (The Host) and I was unexpectedly surprised at how much heartfelt emotion that the director was able to capture. Snowpiercer immediately came across to me as a movie that was meant to be deeper than just a futuristic action movie. While the action sequences were fantastic, I found myself longing for more monologues from Evans, and more understanding about the inner workings of the human ecosystem on this train. While this movie is yet another in a string of post-apocalyptic films, I felt that it brought something new and fresh to the prevalent genre. This wasn’t a world where people are starting the human race over, or humanity has faced a new evolution, or teens are forced to battle to the death. This is a world stuck in time, one that lives unchanged on this train until the end of time…unless….enter Chris Evans. Two Oscar winners and Captain America. What surprised me about this movie was the supporting cast. Octavia Spencer, Tilda Swinton, and Kang-ho Song are three people that I would never expect to see in a movie alongside Chris Evans. However, this welcomed and unexpected grouping was ultimately wasted by the film. All of the actors gave fantastic performances, yet, with the amount of involvement that their characters were supposed to have in the main plot, it all seemed that they fell a bit short. Characters who lay down their lives for this great cause are glossed over, and throughout the movie we’re often expected to feel as if certain characters deaths were more meaningful then the actually seemed. It’s like they said “Oh hey, remember Mike, from 30 minutes ago, yeah he was important, didn’t you get that?” And now he’s dead. This was a recurring problem for the villains of the movie as well as the supporting cast. Just when the movie begins to make progress and you’re about to open the Big Door and discover why they’ve been stuck on this island for five seasons, (wait, no wrong review…) the villain from 30 minutes ago conveniently wakes up and heads back towards Evans and his crew, ultimately negating the last 50 minutes of shoot-outs, avoidance, and clever planning. One of the things that I really respect about Bong’s work is that there is a very strong multi-lingual focus. Characters don’t speak English — the narrative doesn’t demand that they speak English — and their performances aren’t hindered by this fact. Bong has a clever way of getting around language barriers, which lets the audience hear the emotion each actor can express in their native tongue. By the end of the film I was both impressed and moved by performances that would have been stifled if expressed in English. The ultimate point of Snowpiercer is breaking patterns, and that a perpetual life doesn’t necessarily equal a meaningful life. The acting is great with Evan’s monologue at the end of the second act being a standout; the characters are believable and the stakes in this movie feel very real. This isn’t a film where everybody comes out unscathed and your favorite crew members live to fight the next battle. Snowpiercer is a great movie with minimal flaws, great actors, and proves that Evans’ greatness isn’t confined to being the star-spangled man with a plan (re: Captain America). There are a number of very interesting, very satisfying plot twists, all of which keep you guessing until the end of the movie. Forget the bottle, Joon-ho Bong’s Snowpiercer successfully manages to capture lightning in a train. 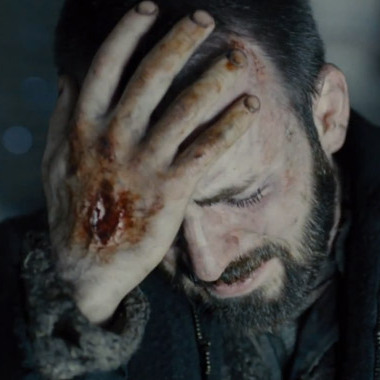 Snowpiercer proves that Evans’ greatness goes beyond being the star-spangled man with a plan.